You might have been already told to drink water for about 8 glasses a day. In fact, you maybe heard that saying several times without the idea of the real benefits of it to your body. For that reason, this article will tell you why you should start drinking more water in order for you to know the benefits it will give to you. Our body contains a lot of water. So it is just make sense that you need to intake a lot of it to replenish your body. Every part of our body, from our brain unto our toes needs water to function properly. So here are some of the benefits you will get by just drinking lots of water everyday. If having a dry skin is always your dilemma, then try drinking lots of water. The water helps moisturize our skin. Too much heat and inadequate supply of water cause dehydration that will more likely lead you to get a dry skin which doesn't really look good. The more you drink water the more your skin will stay moisturize and keeps you away from getting another dry skin day. Drinking lots of water flushes out the toxins from your body. These toxins can cause UTI and kidney stones and the more you drink water the less likely these toxins stays in your body. Our kidney has a job to make our body free of toxins and what it does is filtering liquids passing through it and removing any toxins it can. Having enough water helps these toxins flow freely out your kidney into the bladder and out of your body. To fight hunger fangs, drinking more water can help you control your appetite. So if ever you crave for food just after few hours you've eaten breakfast, try drinking water instead of eating snacks just to feel full for awhile. After that, you can now eat lunch on proper time. Water can also raise your metabolism and can remove by products of fat. Water can also help you have a normal bower movement. A good amount of water helps your intestines digests your food properly which can help you out with your bowel movements. Our muscles needs water to help it work normally and function well. Our cells needs adequate supply of water and electrolytes to be able to work and function properly. 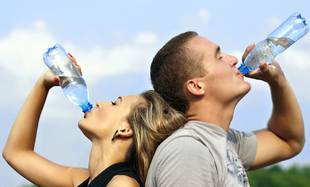 So the more you stay hydrated the less likely you will get muscle cramps & pain. As you have read this article, there are plenty of benefits of drinking lots of water and always staying hydrated. So its better to always have a bottle of water at hand to keep you stay hydrated. Don't forget to also eat fresh fruits which can also help you with fluid intakes.